My husband and I love sushi, but due to our son's fish and shellfish allergy we keep most 'fishy' items out of the house. This is one which is going TO STAY. According to the ingredient list, this is an egg-free, nut-free, dairy-free, fish-free, shellfish-free and most importantly, nut-free product, even though the company doesn't promote these attribute. Not seeing any soy either! My kids don't just like this stuff, they LOVE it! For Real! As a matter of fact, they JUST asked for some to eat while watching their movie. I know some of you may be turning your nose up at this snack, but I think you should try it out. If my 7 and 9 year old inhale it, you just may too! 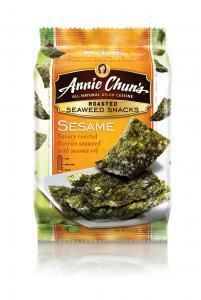 Annie Chun's Roasted Seaweed Snacks, manufactured for CJ Foods, Inc., P.O. Box 911170, Los Angeles, CA. Ingredients include: SEAWEED, CANOLA OIL, SESAME OIL, SALT. For more information, contact: www.anniechun.com, info@anniechun.com or 1-800-374-1035. 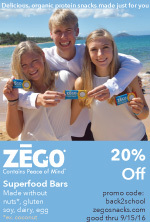 We found them in very handy 'Grab 'n Go!' 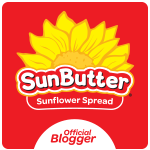 packs which are great for lunches and on-the-go snacks. The packaging contains five 0.1 ounce packs. My son can ate an entire box on his own. There are only 20 calories per pack and 30 mg of sodium each. We are thrilled that with ALL of the things our kids CAN'T eat, this is something we're more than happy to let them enjoy. Give it a try.. your kids' pallet just may be a little more sophisticated than yours!